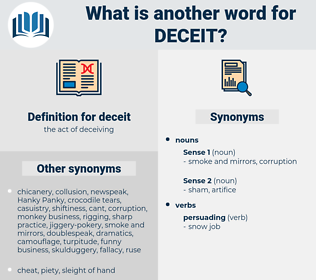 What is another word for deceit? treachery, delusion, mendacity, betrayal, prevarication, scam, dishonest, deceitful, swindle, duplicity, seduction, illusion, sham. 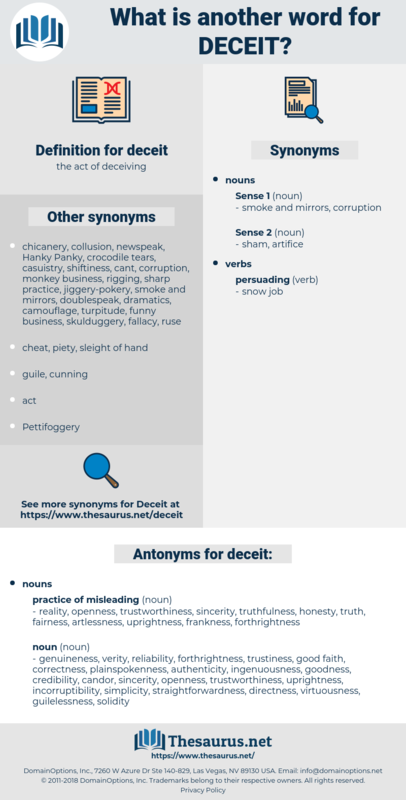 frankness, truthfulness, honesty, truth, reality, fairness. genuineness, verity, reliability, forthrightness, trustiness, good faith, correctness, plainspokenness, authenticity, ingenuousness, goodness, credibility, candor, sincerity, openness, trustworthiness, uprightness, incorruptibility, simplicity, straightforwardness, directness, virtuousness, guilelessness, solidity, candidness, veracity, objectivity, righteousness, plainness, probity, veraciousness, trustability, integrity, reliableness, dependability, decency, honor, artlessness, accuracy. Whether this can be imitated without deceit, and without the use of undignified methods, must depend on the physician himself and his personality. He certainly here practised deceit. decided, decidua, dockside, disquiet, deject, do good, dugout, dogwood, dakoit, detoxicate, dissuade, dissected, dickhead, dogtooth, dakoity, destitute, decade, dictate, dejected, dissect, death squad, deuced, dicky-seat, detested, digit, discoid, dodge city, dakota, digitate, dioxide, detected, dish out, decussate, dog-sized, decayed, detest, dig out, detached, die-cast, dighted, desiccate, De Sade, dedicated, dogged, dusty, desuetude, dasyatidae, dead weight, due south, dagda, dicot, duckweed, disguised, dead set, dazed, doughty, disquietude, dedicate, deck out, dickey-seat, dashed, due west, duck shot, duct, disassociate, desiccated, ducat, diseased, disgust, deceased, do-si-do, disused, dust, digest, decked out, dictated, dziggetai, decked, dissociate, deist, dytiscidae, detect, dacite, disgusted, decide, death seat, dacoity, disquieted, diazoxide, dosed, due east, decode, docket, digested, diskette, desist, decoct, deduct, degust, dacoit, dickie-seat, dished, death's head.